Chef Virgil Emmert, longtime Executive Chef at Oak Ridge Hotel & Conference Center in Chaska, began his food career at L’Hotel Sofitel in Bloomington after graduating from Mankato Technical College. He has also worked with Embassy Suites, Bloomington, Minneapolis Marriott Southwest in Minnetonka and Sheraton Park Place in St. Louis Park, where he owned and operated the first Kosher Kitchen in Minnesota. Before joining Oak Ridge in November 2002, he was Executive Chef and Food and Beverage Director for the historic Rosewood Room at the Crowne Plaza Hotel Minneapolis where he was a three-time recipient of the prestigious DiRona Award. 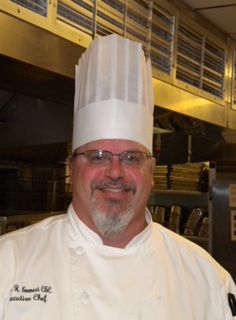 Chef Emmert was included in the Top 25 Chefs in Minnesota by Foodservice News in 2008 and named American Culinary Federation Chef of the Year in 2013. He is also an Approved Culinary Evaluator. The Woodbury Community Foundation, in partnership with the American Culinary Federation (ACF), present the premier culinary event of the season, CHEF FEST 2017 which will bring together the Twin Cities finest ACF Chefs to dazzle your tastebuds and challenge your palate.